The month of Rab’ee Al Awwal is the month in which our Beloved Prophet (Sallallahu alaihi wa sallam) was born. Allah Most High has made His birth distinguished. 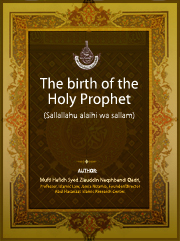 To express the towering status and grandeur of the Holy Prophet (Sallallahu alaihi wa sallam), Allah Most High sent down innumerable blessings and caused such a glad atmosphere that the year of the Prophet’s birth is remembered as the year of joy and delight. In this verse of the Holy Quran, Almighty Allah swears by Makkah. Let us see what wonderful signs were revealed by Allah on this birth which the Lord swears by. The Holy Prophet (Sallallahu alaihi wa sallam) came last among all the Prophets (May peace be upon them), but His radiance (Noor) was created before the universe itself. Translation: The first thing that Allah created was my radiance. Almighty Allah created the radiance of the Holy Prophet (Sallallahu alaihi wa sallam) before everything else and graced that radiance in many ways. When that radiance stayed in the back of Hadhrat Adam (May peace be upon him), it made the angels prostrate to him. In the same way, this radiance was transferred to Hadhrat Nooh, Hadhrat Ibraheem and Hadhrat Ismail (May peace be upon them) and honored them all.